Introduction: Monsignor William J. Kerby helped galvanize Catholic social workers in the creation of a number of organizations, most notably the National Catholic Conference of Charities in 1910. He was a prolific writer and editor and spent most of his life as a professor at The Catholic University of America (CUA), helping found and head the sociology department. Kerby held a White House-appointed position on the Board of Charities in Washington, D. C. starting in 1920; was given the rank of domestic prelate by Pope Pius XI in 1934; and worked closely with Msgr. John A. Ryan and others who stressed the importance of worker’s rights and the papal encyclical Rerum Novarum, a foundational text of modern Catholic social teaching (American Catholic History Research Center and University Archives, 2017). Kerby advocated for long-term solutions over short-term relief for the problems of poverty and embrace progressive reforms such as child labor laws, fair wages, and public health reforms (Hartmann-Ting, 2008). Education and Career: Msgr. Kerby attended public and parochial schools and graduated from St. Joseph’s College in Dubuque, Iowa in 1889. He was ordained in 1892 at St. Francis seminary in Milwaukee, Wisconsin then received a Bachelor of Sacred Theology and a Licentiate in Theology by 1894 at CUA. Kerby studied in Bonn and Berlin, Germany and Louvain, Belgium, concluding his formal education by receiving a Doctorate of Social and Political Science from the University of Louvain in 1897. Kerby would later receive an honorary doctorate of Laws from Notre Dame University in 1913. William Joseph Kerby was born to a privileged, intellectual, and devout Catholic family in Lawler, Iowa, on February 20, 1870. Young William was close to his nine siblings and was taught Latin and Greek at home. He often served impoverished neighborhoods and had a heart for those in need. Kerby’s family members provided emotional support for him throughout his life, and Kerby would later live with three of his sisters (Josephine, Ora, and Leo) in lieu of the rectory. Kerby attended school in his hometown then nearby St. Joseph’s college. By the age of 22, he was ordained a priest and encouraged by those at St. Francis Seminary to further his studies at newly opened CUA. Kerby’s focus was theology, yet his mentor Fr. Thomas Bouquillon stressed the use of social science and analysis in moral living in addition to more established seminary curriculum. His interest became focused on sociology, and he studied abroad in order to help direct the developing field’s new department at CUA. In 1897, he received his Doctorate of Social and Political Science from the University of Louvain in Belgium then returned to CUA to teach. Kerby was considered engaging as well as insightful by his students. Kerby was a long-time professor of sociology at CUA and also taught at nearby Trinity College where he served as first chaplain of the school when it was founded in 1900. Kerby’s personal connection to the poor drove his sociological thinking, and he often spoke of the need to get to the root causes of poverty rather than solely focusing on immediate relief for those in need. Kerby believed the Catholic Church could better serve the poor if there was greater organization and training for those involved in the church’s social justice activities. In The Considerate Priest, Kerby discusses issues particularly related to the relationship between Catholicism and social work. He acknowledges the understandable suspicion of the new field in the eyes of the Catholic Church as opposed to charity and tending to individual needs; however, Kerby asserts that the church needs to get past “the seduction of easy benevolence” (Kerby, 1950). He called for parishes to begin record-keeping social concern activities in order to be as effective in care just as the church was in legal and financial matters. Kerby believed that social work served the general distress of civilization while charity served to alleviate the immediate personal distress of the individual, yet he emphasized that both could have supernatural motive and dignity of service. He used analogies involving the function of the Catholic priest to demonstrate his idea – confession dealt with the individual sin like charity deals with individual need; the sermon was a message to the whole community to avoid sin just as social work functions to prevent the community from needing relief and charity on an individual basis. Kerby’s most famous work is The Social Mission of Charity (1921). He considered the goal of the book “…to discuss fundamental points of view in the relations between Catholic charities and the prevailing sociological interpretations of poverty and relief” and “neither methods nor problems are treated in any detail” (Kerby, 1921). Kerby speaks of the duty between groups to care for each other, not just individuals, and the need for methods and systems to provide solutions to mismanagement of relief. Kerby goes on to discuss the root of poverty in American culture and proposes a spiritually-based social work solution which he hopes Christians will embrace lest they lose their role as moral and spiritual leaders of the U.S. He recognizes poverty as a social arrangement and discusses the ideas of justice and equality in relation to poverty, as well as warning against the dangers of an unjust system of property ownership. Kerby also warns against disassociating service for the poor from religious and spiritual motives and discusses principles of relief. He professes a hope that greater literature about relief will make care for the poor more effective and recognizes the new leadership role of social workers in utilizing this literature. Finally, Kerby emphasizes the need for Catholic social service to set the ideal for a more scientific charity and keep the spirit of lay volunteers and clergy who have been practicing valuable charity already, especially in organizations like the St. Vincent de Paul society. The Social Mission of Charity was considered a biography of Kerby’s own work and hopes as one of the earliest Catholic sociologists and an authoritative handbook for Catholics in the field of social work. Kerby’s authorship of The Social Mission of Charity solidified his standing as an influential leader in the field previously established through his editing and organizing activities. In addition to his teaching role at CUA, Kerby’s support, effort, and inspiration contributed to the foundation of the National Catholic School of Social Services, and he would later act as director of the school from 1924-1929. He worked in the St. Vincent de Paul society, specifically helping organize the Christ Child Society in the D. C.–Baltimore area. His connection to the society continued in the discussion of the organization in his publications and Kerby’s editing of their quarterly journal from 1911-1917. Notre Dame University recognized his work in 1913 with an honorary doctorate of Laws, and Kerby edited the Ecclesiastical Review from 1927-1936. In 1920, the White House appointed him to a position on the Board of Charities to which he was reappointed twice. Kerby (left), with Rector Shahan (center), and John O’ Grady (right). All three were instrumental in organizing the first NCCC at CUA in 1917. Photo: Courtesy of The Archives of the Catholic University of America. Kerby’s most notable involvement in Catholic social service was helping organize the National Conference of Catholic Charities (NCCC) and the National Catholic War Council in 1917 with Thomas Shahan. Kerby held the position of executive secretary from 1910-1920 with NCCC and also founded the organization’s newsletter Catholic Charities Review. He helped organize the first meeting of the NCWC at the request of Fathers Lewis J. O’Hern and John J. Burke who hoped to organize efforts to increase the amount of Catholic chaplains in WWI. These two organizations are still influential and today are known as the United States Conference of Catholic Bishops and Catholic Charities USA respectively. 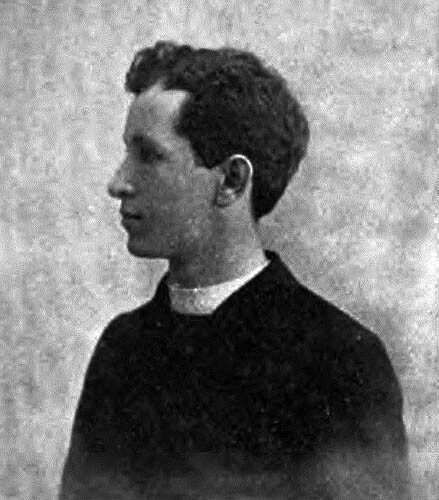 Throughout his career, Kerby wrote hundreds of articles on a variety of sociological and other topics, and he also wrote the books The Young Priest and His Elders, The Prophets of Better Hope, and The Impact of Years which included descriptions of the ideal role a priest would take in the community among other topics. Many of the themes in his writings are still relevant today including: the poor’s perception of the law as punisher and not protector, the indignity suffered by the poor in receiving inadequate and unfriendly relief, the need for secular and religious organizations to work together, social work’s responsibility to protect the defenseless and make individuals self-sufficient, and viewing social work problems in the family context. Shortly before his death, Pope Pius XI gave him the rank of domestic prelate in 1934. On July 27, 1936, Kerby’s life and career ended in Washington D. C., although Introduction to Social Living was published on his behalf in 1948 by the William F. Kerby Foundation. The foundation was just one part of his lasting legacy for Catholic social teaching in the United States, and the work was a compilation of his notes for an introductory sociology class. The course covered topics related to general socialization, philosophy and human rights, and concluded with religion’s relationship with the social landscape. The Forward to Introduction to Social Living states: All that he taught, he lived to the letter. His life enhanced and emphasized his words. He lived Catholicism; he lived democracy. And he inspired us to carry his teachings into our daily living (Kerby, 1948). 3. Introduction to Social Living by the William J. Kerby Foundation, Washington, D. C.: The Catholic University of America Press, 1948, Forward. Hartmann-Ting, L. E. (2008). The National Catholic School of Social Services: Redefining Catholic womanhood through the professionalization of social work during the interwar years. U.S. Catholic Historian, 26(1), 101-119. “The Catholic Minority after the Americanist Controversy, 1899-1917: A Survey” by Thomas T. McAvoy, The Review of Politics, 21(1), (Jan., 1959), pp. 53-82. “Review: The Social Mission of Charity, William J. Kerby” by Floyd Keeler, The Catholic Historical Review, 7(4) (Jan., 1922), pp. 526-529. Contact the American Catholic History Research Center and University Archives at archives@mail.lib.cua.edu.